When Cheryl @Meadow Mist Designs and I were discussing her pattern writing blog series, she asked if I felt strongly enough about any of the topics to expand out and write a full blog post. Honestly, as I sit down to work on this topic now, I am not sure what drew me to wanting to talk about Design Inspiration exactly… but I know I have a lot of thoughts that will hopefully come together into a cohesive whole. I believe there is a more philosophical based version of my “you become what you repeatedly do” quote. However, I believe that this one idea is a key to much of the success I have had in my life. Show up. Try. Learn. Repeat. Just by following along with Cheryl’s pattern writing series, you are putting in the first effort required. You are showing up. The next key? Try. 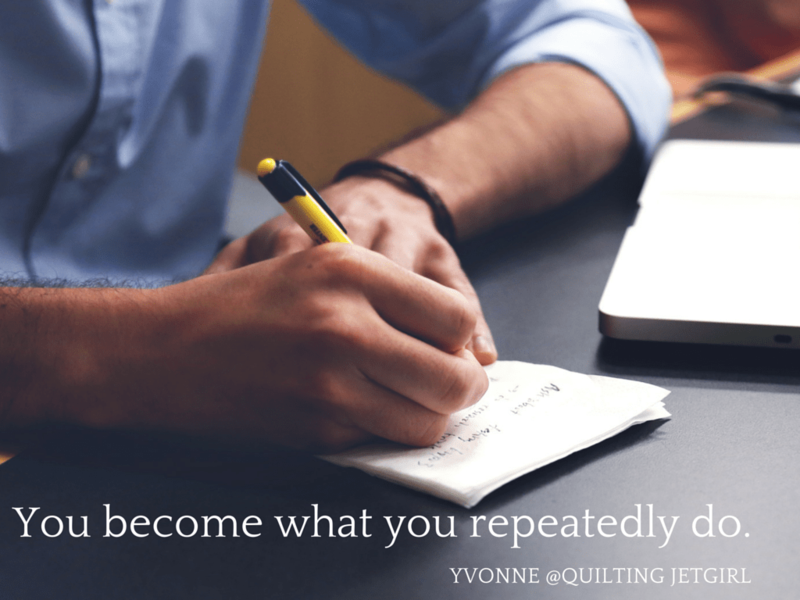 How did you become a quilter? One stitch at a time, right? I am guessing that the time you have devoted to learning to sew accurate quarter inch seam allowances, and the time you have taken to learn which direction you like to press your seams, and the time you have invested to develop an idea of the kind of piecing methods you prefer has started to really add up. I challenge you to devote 10 – 20 minutes of each day to doodling a quilt design. Does that sound familiar? It just might. It is how I got started: Quilt Design a Day (QDAD) (a closed Facebook group). The goal is to spend a little time (15-20 minutes) each day, creating a quilt design. The design can be as simple or as complex as you like. To spark our creativity, we have users contribute images and color palettes for inspiration. In addition to producing a design daily, QDAD helps members strengthen their creative process and hone their creative style by sharing constructive feedback. It’s December 23rd. You receive a request to make a quilt top, quilt it, bind it, AND deliver it by the evening of December 24th. That is an over constrained problem; specifically surrounding time. Day 1: Picking colors and making squares – Make a 9-patch using the design-seeds color palette of your choice. Day 2: Making circles – Make a design using only circles. Same size, different sizes, overlapping, on their own, doesn’t matter. Use the design-seed color palette of your choice. Day 3: Triangles – Same as above, but using triangles. They can be HSTs or equilateral or geese or wonky. Whatever you want. Use the design-seed color palette of your choice. Day 4: Rotation – Using squares, make a diamond-based design (put it on-point). Use the design-seed color palette of your choice. This is a very effective build up technique meant to lead you to early successes while building up your skills to tackle the big ideas that you want to be able to represent but feel overwhelmed with where to start. Before you know it, by simply showing up, trying, and working through easy exercises for a few short weeks… you will suddenly be skilled enough to branch out with fewer design parameters and create with fewer design considerations. I have blogged about the benefits of joining QDAD before, and I am sure I will blog about it again. I honestly believe it is worth considering joining the group and participating for a month. By the way, Triangle Transparency, which is going to show at QuiltCon West in Pasadena in less than a month, was my 3rd QDAD design. That’s a great quote! It’s almost like free motion quilting – when you practice, you improve, and you know that motif like the back of your hand. This is absolutely true — constraints are your friends when designing. The best way to solve a problem is to first identify what the problem is, and what your resources are. Then you can start to come up with solutions. I had the same thought as quiltyhabit, as I read through your post. Lots of information to help inspire here. As always, thanks, Yvonne. Show up. Try. Learn. Repeat. Just the words of encouragement I needed today. I’m going to make a note card of this to put in my sewing room. Thanks, also, for the info on QDAD. I’m going to check it out. I like the analogy to FMQ – at first it can be difficult but spending the time and a little bit of practice gets you past that difficult stage and you see quilting motifs and pattern ideas everywhere. Ideas are plentiful – how do you hone in on the one you want to make? 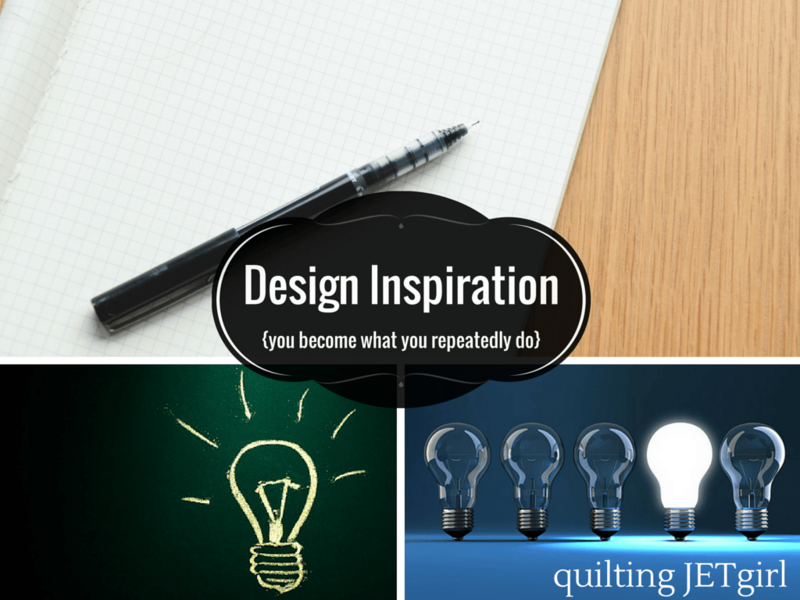 Excellent post, thanks for describing your inspiration and ways you design quilts! Clearly, it is like most everything: “Practice. Repeat.” Ha. That’s the saying on my yoga studio’s hoodies and t-shirts, both of which I own. Congrats on TT in QuiltCon! This is an inspirational post Yvonne. Thanks for sharing. It gave me the reminder that you have to actually do it to improve! It’s like ‘lather,rinse & repeat’…you only get better the more you do and try. Great post Yvonne! Yvonne, Your quote is bold and true in the majority of our walk in life. Every time we strive to improve or learn a new skill we have to take the time to practice and reach our goal before we truly can take that next step. Plus, the way in which you write your thoughts or present them always makes me stop and think and look at my projects in a different manner than I normally do. Which has resulted in a tremendous new amount of energy for learning and discovering quilting in just a new light. It is always interesting and starts a fun discussion when I ask my quilting friends or even my husband to consider adding an extra element of fabric to a block or taking one away and what the effect would be. Plus, many other examples…but it is a great way of learning and starting to develop a new pattern. Thank you for sharing and have a fantastic day of creating. Staring with some parameters is an excellent suggestion Yvonne. Color palettes from QDAD and the basic shapes explorations are all good places to begin playing with design ideas. My problem is usually to stop designing and start sewing. Begin. That’s my word for the year. I think your post will help people begin. I’ve always like the idea “fake it till you make it” but your quote is a much more polish way of saying that without adding the idea of being fake in the beginning. I agree, I use this at work all the time and especially with my new employees or if I am challenging my employees to do something outside their comfort zone. Really well written post Yvonne. The thing that is hardest for me is to get past my very deep seated belief that “I can’t”. I can’t draw, I can’ think of original design, I can’t whatever. Part of me wants to blame it on elementary school. We all went to parochial school and everything was graded, including art and handwriting. Those were awful grades for me. Always a ‘C’. So, it is hard to get past it. I like the suggestions here. I have been doodling a lot, following along with Lori Kennedy. It helps free your up. Can’t do anything unless you put yourself out there and try. I love the statement you become what you repeatedly do. It is what helps us build skills. I’m going to do the design a quilt a day exercises and I thank you for the parameters. I agree as above…I can’t draw. But you’ve made some great points. I actually joined QDAD this week. Guess I need to get to practicing. That’s for the tips!! Great post. I remember reading (don’t remember where) that the hardest part about design or any creative skill is that for a long time your skills might not match up to your vision (or meet your standards). But you should keep practicing and eventually you’ll get there. I find that helpful to remember when I find my designs to be just so-so. What about inspiration overload? 🙂 I have almost 20 ideas buzzing about and I only need to make ONE cushion for the swap. Sigh. Showing up and trying are great advice. I am of the bite-off-more-than-I-can-chew-and-chew-like-crazy school. It works! Great question, and one I probably need to ponder a bit more to have a good response. I think that in general, I have bursts of creativity related to design. When that happens, I try to get all the ideas sketched down so I don’t lose them. Then I can look over them when I need something. If I were in your shoes and needing to narrow down a wide range of ideas for something, I would start thinking about how much fabric each different design would take. Since I happen to know that your goal is to work from your stash this year, I have personally found that my stash limitations tend to help me narrow down my designs effectively. 🙂 Other design considerations can also pop up when thinking about the details of a design, like how intricate / time intensive I can allow myself to be, whether the design is interesting enough for me AND the person it is being made for, etc. Great post Yvonne! Showing up and trying on a regular basis will get a person very far. I love your thoughts on using design parameters to avoid the pitfall of feeling overwhelmed. I feel like Ricochet Rabbit if I don’t define the direction i want to head first, LOL. I tend to do “freefall” design – meaning an idea comes and I do it. I sort of like the idea of setting parameters, though. That might be fun and a good challenge to creativity. I do love a challenge – it seems I only like to do things that require a lot of sitting and thinking on my part (oh, and re-cutting, seam-ripping; any kind of re-doing) But that’s the way it seems to work for me. I do feel like I grow with every piece I make, in skills and in other ways, too. So it’s worth it. I haven’t done QDAD in a while because I feel like I have so many ideas already, but maybe I will go back to it and check out the challenges part. Thanks Yvonne for sharing your thoughts. Such a good quote/piece of advice for life generally. I always like to think of creativity as a muscle that needs exercising. And you are always so good with actually walking the walk rather than just talking the talk.